Good news for fans of beer who were aware of the provision of renewable energy. Apparently, their penchant can 'help' the supply of energy in question. According to the University of Colorado Boulders, the beer-brewing requires an average of seven barrels of water for each 1 barrel of beer produced (1 barrel is equivalent to 159 liters). The problem, as quoted from Newatlas on Saturday, October 8, 2016, not all of the waste water can be flowed to the sewer due to be screened in advance. And this process is quite costly. However, the researchers said that now there are other uses for the the beer-brewing wastewater. The wastewater from brewery can be used to grow the fungus that can then be processed into electrodes for batteries. 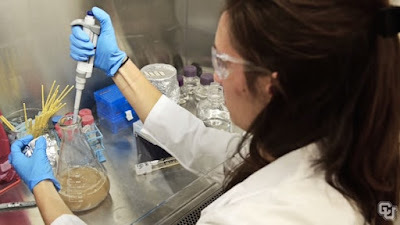 Through a number of tests in the laboratory, the scientists of University of Colorado Boulders added the Neurospora crassa fungal spores into the the beer-brewing wastewater. After the water stirred and warmed for 2 days, then mushrooms grow in the sugar-rich water environment. Mushrooms were then harvested through a filter, and then baked at a temperature of 800 degrees Celsius until charred. The result is a carbon-rich materials have been reported to produce "one of the most naturally efficient Li-ion battery electrodes to date." Meanwhile, the remaining water is already filtered out when the fungus is harvested. If it can be developed to a commercial level, this process can provide the incubation medium was prepared for a battery maker. On the other hand, the process can reduce the amount of wastewater that must be purified by the brewer.